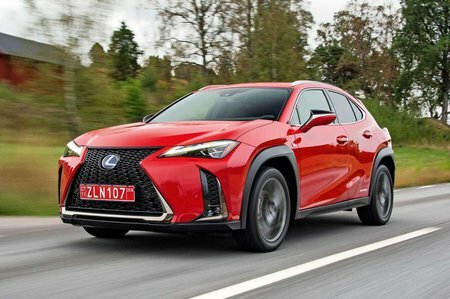 Lexus UX Performance, Engine, Ride, Handling | What Car? The UX's hybrid set-up comprises a 2.0-litre petrol engine and an electric motor. It produces a combined power output of 181bhp and is smooth, responsive and measured in its power delivery around town. However, it gets up to motorway speeds steadily rather than speedily, and has less low-down pulling power than diesel rivals; you have to work the engine hard when carrying heavy loads or if you need a sudden burst of pace. The hybrid system is paired with a CVT gearbox, and while such gearboxes are referred to as automatics, they actually use a single, variable gear. As a consequence, when you accelerate hard, you’ll notice the engine speed soar noisily and the rev counter needle hang around the top quarter of the dial. Fortunately, although acceleration incites a bit of a racket, the engine note settles down surprisingly well at speed and isn’t as intrusive as in other CVT-equipped models. Road and wind noise are noticeable inside, though. The UX offers a smooth, settled motorway ride that absorbs surface imperfections with ease but fidgets a bit at lower speeds. It’s when driving slowly that you’ll also notice how grabby the brakes feel; this is a trait typical of hybrid cars and can make it difficult to stop smoothly. The steering is very smooth and light; this is fine around town, but it doesn’t feel particularly accurate at higher speeds. Body roll, meanwhile, is well controlled and the car remains fairly composed when you're stringing a series of corners together. However, a BMW X1 is a more agile and rewarding companion on a country road. The F-Sport trim level features sports suspension with ‘performance’ dampers and can be specced with Adaptive Variable Suspension (AVS) at extra cost. In the sportiest driving modes, this firms up the suspension to help the UX lean less in corners but still doesn’t make it particularly inspiring to drive quickly. All UX variants have front-wheel drive as standard, but E-Four four-wheel drive is optional across the range. It isn’t intended to turn the UX into a Land Rover Discovery-like mud machine but adds a little bit of extra traction to complement its SUV style. The system is only available in conjunction with additional option packs, though, pushing the price up considerably; the cheapest UX with E-Four costs around £6000 more than the standard model. We don’t reckon most drivers will need it; the two-wheel-drive version will do unless you routinely encounter adverse driving conditions.